The author, right, and fellow ski guides. The sun is just beginning to inch over the Montana peaks and sparkle off the mirror-smooth lake surface as I stomp my way through the boot-deep powder in the currently deserted mountain village. In these early morning hours before the first of the maintenance crew has arrived to clear the snow, before there's a single car in the lot and before any ski racks or signs have been set out, the village often resembles some kind of winter war zone. Finally entering the comfort of the Schweitzer Mountain day lodge, I gather with my fellow guides, snowcat drivers and desk staff to formulate step one of today's plan. Back outside now there's more light reflecting off the lake as my assistant guide and I sweep the six fresh inches from last night's storm off our snowmobiles. We make the radio call to mountain ops clearing our uphill travel, "Two snowmobiles first aid to top of the quad." Then we're off, heading 2,000 or so vertical feet up to the Selkirk Powder Company guide lodge near the top of Schweitzer Mountain Resort located just 100 or so yards from the top of the Great Escape Quad and newly built Sky House. Ducking low on our machines to sneak under the rope line that define where public skiing at Schweitzer stops and our terrain begins, we pull to a stop and unload supplies for the day. Before we enter the lodge, the assistant guide begins the always unenviable task of shoveling the place out and then I head in to start on daily weather reporting. From inside, I record the current temperature as well as the low temperature from last night, current wind speed along with the high wind from last night and barometer reading. Next up, I head back outside with the tools of the trade, shovel, thermometer, snow crystal card and weather ops clipboard. After an awkward trudge through the deep snow, I arrive at our snowfall recording boards and note that the snow here is significantly deeper than at the base, maybe 10 inches total. There are several daily snow measurements to be taken once I reach the boards: 24-hour depth, storm total depth, season snow depth, 10 centimeters below surface depth temperature, snow crystal size and shape, foot penetration depth, current sky cover and precipitation. Back on the snowmobile I head out to do some conditions investigating. With a little over 4,000 acres of skiing to consider, there's never enough time to gather data on all of it, so I draw on past experience to decide what zones to inspect. Since the cat hasn't yet been out to groom these roads today, I encounter deep snow drifts and frequently strain against the steep inclines and weight of the machine. As I speed through the backcountry maze of roads I'll drag my foot through the fresh snow to check for crust and consistency and, from time to time, hop off and post hole out into one of our named runs to get a closer look at how things are shaping up. Since job No. 1 for a backcountry ski guide is to ensure the safety of the guests, my final task is to identify a slope which could be an avalanche hazard and dig a pit to take measurements and test the stability of the snowpack. After recording the results into an app which is shared by all of our guides, I climb back aboard my trusted steed once more and speed back to the Selkirk Powder guide lodge. Back inside, again I confer with my driver and assistant guide and lay out the morning ski plan. The snowcat is dispatched to the first run pick up and we head out the door to arrive at the top of Schweitzer's Great Escape Quad chair in time to greet our guests for the day as they unload the chair. Once we're all gathered and introductions are made, I spend the next few minutes going over safety and procedural aspects developed to ensure all our riders have a fun and secure day of shredding untracked snow. 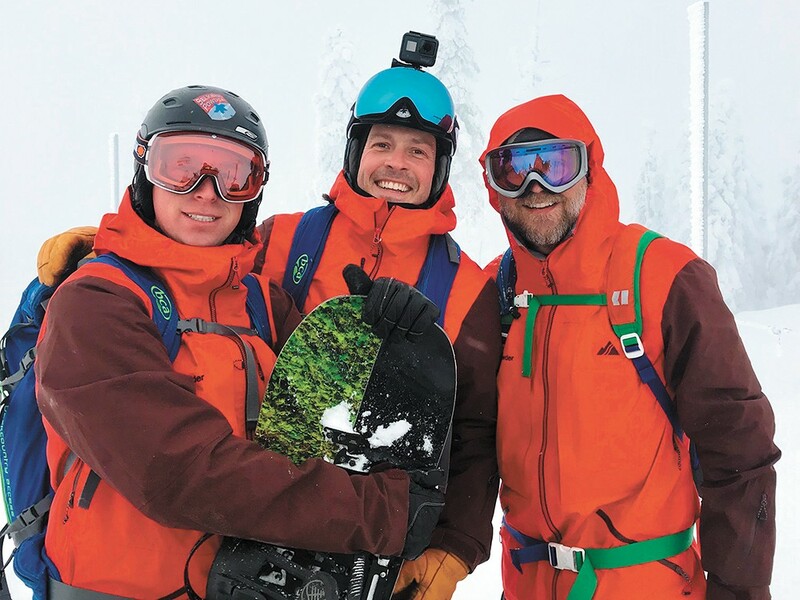 A host of issues are covered, including how to use the buddy system, what to do in the event of a tree-well accident, how to travel safely in our backcountry playground, what steps to take in the unlikely event of an avalanche and much more. After a final check to be sure that each and every person in the group has a functioning and well-charged transceiver as well as proper knowledge of how to use it, we're finally ready to let gravity take over and begin the fun task of putting smiles on faces. Following a brief but detailed description of the run, I shove off and drop into the old growth forest. The clouds have all but vanished from the sky and the sunlight on the freshly fallen snow sparkles as I carve a heavenly path through the untouched canvas. The stress of the morning tasks fades away now as the fluffy crystals float up from the surface and dance lightly just over the tops of my thighs. I yodel from time to time to help the guests keep a bead on my location, but they can almost certainly follow the singular trail my skis have etched among the forest of giants. Finally sliding gently onto the cat road at the run's end, I belt out a scream of childish glee. I may have skied thousands of other powder runs but the joy of one more never grows old. John Grollmus is an avid skier, local restaurateur and professional lead ski guide with Selkirk Powder Guides. The original print version of this article was headlined "Off the Grid"